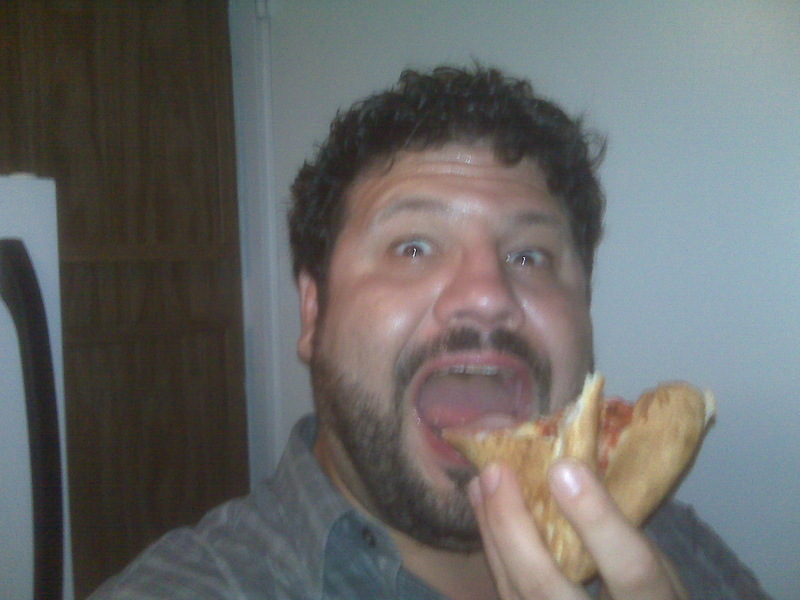 As a snobby Jersey pizza gavone, I rarely get pizza outside of New York and Jersey. Maybe Chicago, if I feel like eating a slab. After a long day of hiking and horseback riding, we collapsed at Courtney’s place and planned to go to a sushi or local place after a nap. Didn’t happen. Thankfully she had a pizza menu on the fridge, so I gave La Pizza Rina a call. “We no deliver late Friday!” was the answer I got. 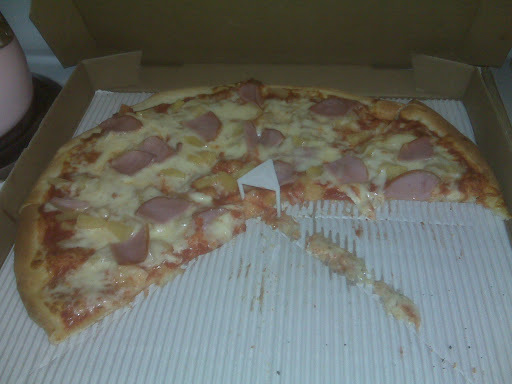 I pumped the address into the Google and it was a short drive away, so I ordered a large pie with Canadian Bacon and Pineapple, what we’d call a Hawaiian-style pizza back East. Actually I think I first had that combo in California, and in Italy they claim it is a German invention. Wikipedia knows all. In NYC, the Chinese places outside of Chinatown are run by Mexicans and the Mexican places are run by Chinese. So I was not wary when I walked in and the cooks and clientèle were all of Asian extraction. I grabbed the pizzas, a passion fruit drink and a diet coke, and a bag of breakfast rolls (danishes, cinnamon and pain chocolate, etc) for about $20. That’s a good deal anywhere. I was surprised at how good it was. The New York water helps give it that chewy bubbly crust, but theirs was pretty damn good. They didn’t coat the pan with semolina crumbs like we do here, but the pizza folded properly and wasn’t a revolting Midwest cracker-crust, it was a good hand-tossed dough. The sauce didn’t stick out but also wasn’t overly sweet, and they were extremely generous with the mozzarella. It wasn’t fresh-made, but it was not greasy cheap cheese either. The toppings were tasty and generous as well. So you can get a good pizza in Honolulu, even if there’s not a paesano behind the counter. 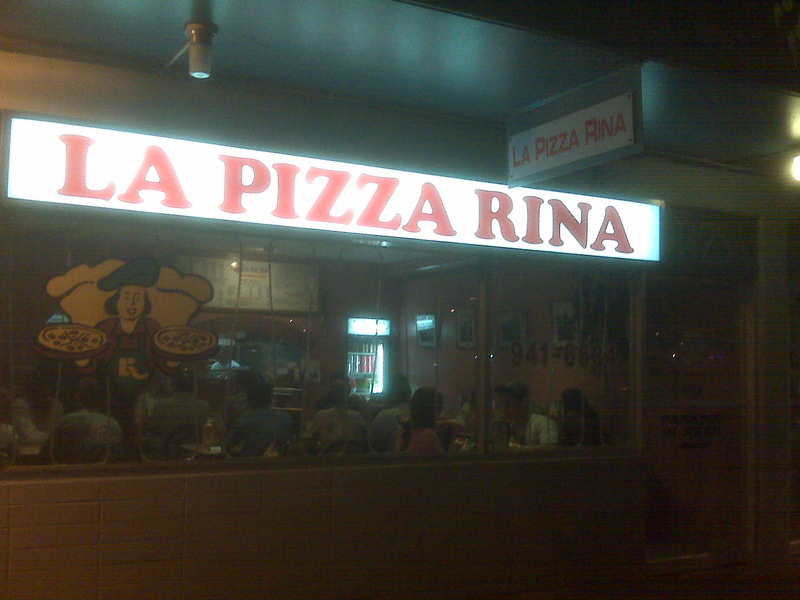 Try La Pizza Rina. I dunno if the old lady running the joint is Rina, or if that’s Engrish for Pizzeria, but I’d go back again. Ono Kine Grindz says they serve good lasagna too.